If you're into sneakers, you're into sneakers. As more of an ankle boot and kitten heel kind of gal myself, the world of sneakers has always been a fascinating one to me. From the massive cult following that can build before a sneaker even drops to the intricate resale marketplaces that serve the most loyal sneakerheads, there is a lot to be learned about this industry, and I was ready to dive right in. In a recent meeting with GOAT, the world’s largest marketplace for buying and selling authentic sneakers, I learned that its female user base is growing at a rate twice as fast as its male user base. But this doesn't just apply to who is shopping; it applies to what they are shopping. The female shoppers at GOAT are buying men's sneakers at rapid rates, skipping over the women's designs more often than not. "Most of the time I want to wear the same sneakers guys are wearing. The sneaker game is pretty gender-neutral, and size preferences automatically finds the best fit based on which brand I want," says Diane Abapo, GOAT's director of content. GOAT has a feature that allows you to shop according to your shoe size in both men's and women's styles, so that way you don't have to waste time converting your women's shoe size into men's. The result? Making shopping from the boy's section easier than ever. Curious to know more about which men's sneakers women are buying? So was I. 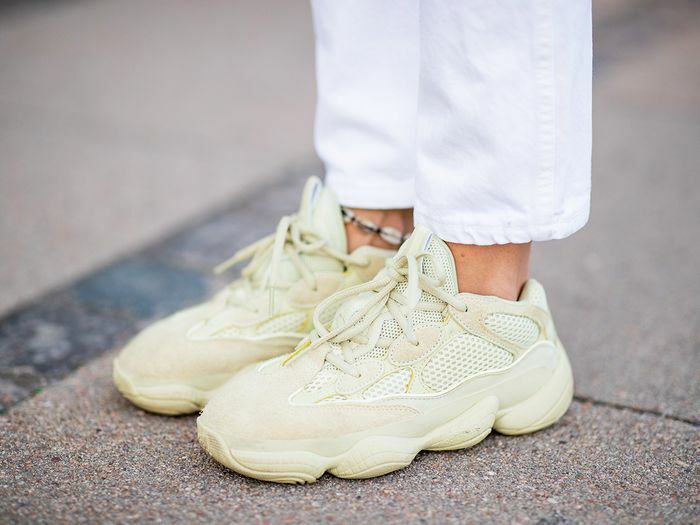 Ahead, Abapo goes on to share all of the information on the men's sneakers women can't stop buying from their site including the latest Yeezy's, Air Max, and more. "Aesthetically, the profile of the Air Max 97 looks really sleek. It also gives you a little height boost when worn. Metallic gold always stands out stands out to me, and I'll wear these with gym leggings or tapered denim pants." "I love how much you can see the shoe's unique lines in this Silver Bullet colorway." "The Air VaporMax Flyknit 2 is super slimming when worn. It fits like a sock and feels like you're walking on air. This is a no-fuss shoe. They’re easy to pack when traveling and can be a go-to gym or running shoe when you have to pack light." "This Blazer is a very simple classic high-top by Nike. It has a vintage look and feel with the leather upper and touch of suede on the toe box. I also like how the tongue has a raw finish – similar to the Off-White blazers. I’m grabbing these whenever I'm on the go to pair with straight leg or skinny jeans." "These are the comfiest sneakers I own! I always wear them with my black cargo pants, sweats, or trousers. They look good with anything—especially in the natural colorway." "The Air Max Plus in Sunset flies under the radar, yet still has somewhat of a cult following. I'll always lean toward a vibrant colorway that still looks classic." "These are practically slip-ons that you don't have to lace or do much with once you put them on. Perfect for any woman on the go who wants a different take on the classic white (upper mesh) sneaker. You can wear throughout different activities on any given day. This can be a gym sneaker, a walking shoe, or even something to pair with a pantsuit." "I love a good vibrant mix of colors. I like this one in particular because of the translucent upper. They feel like a sneaker you can wear to the gym or after-work evening dinner with friends. The colorway definitely stands out." "Practically a slip-on. I only wear these with baggy sweats, and they make me feel like I'm walking on clouds. This is definitely my ideal sneaker to wear when I'm at the airport." "The Fear Of God x Air Skylon 2 is a premium white sneaker with tonal leather and suede overlays. Clean and classic." "You can rough these up and wear them for long periods of time without having to worry about keeping them clean. They're durable shoes that still give us a little bit of height when worn. Wear them to a music festival. Get them dirty. They'll be fine." The same goes for the blush version. "The Air Force 1, to me, is the original chunky sneaker. The simplicity of the Air Force 1 lets you get creative with your outfit. I pair an AF-1 with a good set of baggy jeans. (The baggier the better.) I like this style in particular because it has several hits of the Swoosh all throughout." "This is a super classic Air Jordan 1 colorway." "Nostalgic in every sense of the word when you think of the Jordan brand and the GOAT himself." "The Shattered Backboards are a little different and unique, but they still complement a variety of outfits." "I said it before and I'll say it again, Chris Gibbs is the man. He created his own instant mashup classic Air Jordan 1 sneaker that stands on its absolute own. The Union x Air Jordan 1 goes with anything and everything."